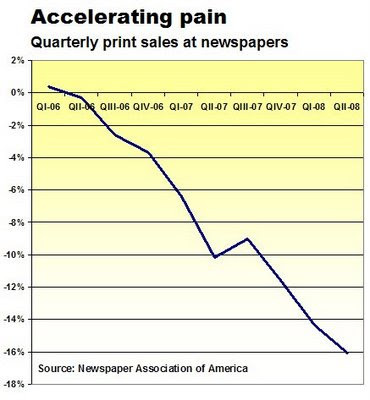 Reflections of a Newsosaur: Newspaper sales fall record $3B in 6 mos. I don't see how the industry can survive in any recognizable form. AWESOME!! I LOVE WORKING FOR NEWSPAPERS AND THEY LOVE ME BACK. remember the days when there was good news maybe once every four years or so? The best news recently at our paper: the cleaning staff determined that the mold growing under the Coke machine is not hazardous. The partisan smears against Sarah Palmer, and the cover-up of the John Edwards scandal, have proven that American newspapers are simply an arm of the Democratic Party. They serve no useful purpose. Let them go bankrupt, and soon. Unfortunately, if you look at the numbers using constant 2008 dollars, the news looks even worse. I haven't run the chart yet with online numbers included, but there's clearly not enough online revenue in 2008 to make up the $4 billion needed to bring the combined total to 1982 levels (in constant dollars). Given the economic forecast it's going to get a lot worse than better in the short to medium term. If newspapers are "an arm of the Democratic Party," they're a really bad arm. Especially since they cheered or ignored just about every horrible decision made and crime against Democracy committed by Pres. Bush over the last eight years. That said, what's with the conservative trolls? Why does everything have to be about politics for bitter right wingers? And who is Sarah Palmer? I think if you went back to newspapers owned by families or individuals instead of corporations who have to please all those stockholders, it would go better. A newspaper can be run to earn an acceptable profit figure but when a corporation owns it, that profit isn't big enough because newspaper revenues aren't growing as are other industries. Soooo, in an effort to create more profit by eliminating expenses, the beancounters axe the very newstaffers who put the news in newspapers and the cycle continues. Uh-huh. And P. T. Barnum never needed that elephant to put butts in the seats either. Now that the classified advertising market has collapsed, it does not matter who owns newspapers. Most of them simply are not viable businesses, in my opinion. Well clearly, all they need to do to turn this around is get rid of even more content, that'll bring the readers back! It should not be any great mystery or surprise major newspapers are failing and losing readers at such an enormous clip. Main Stream Media made the disgraceful and completely un-American decision to decide what was news and to what extent that news would contain full disclosure and actual (unbiased) useful information. Major stories have been completely ignored by major media organizations if they did not further the agenda of their favored political/commercial interests. Newspapers, Magazines and network news providers have ceased providing fair and honest journalistic, investigative and objective reporting on important, critical issues. I personally believe this is a deliberate, industry-wide effort to make populations more susceptible to orchestrated, below the radar manipulation and control by megalomaniacal neo-con groups, organizations and individuals that truly control the media empires of the world. I only hope that this reported economic failure is a direct result of the public's realization of and refusal to be so shamefully used and mislead by formerly great and trusted institutions. Given the economic background, this is bad news. turn off the lights...it's over..the printer is jammed. Apparently you don't know who Sarah Palmer (or Palin) is either. I followed the link to the data by NAA, but nothing appears on 2008 ad revenues. The data ends on 2007. Perhaps it was removed...? is an updated link to NAA data. I worked for newspapers as a reporter for over 30 years - the most recent The philadelphia Inquirer. I took a package and left in 2007. My advice - GET OUT NOW!!! Being a print journalist is like working for a pay phone installer - no future at all!!! I found a grest new career and advise anyone still in print media to find new work NOW before the market is flooded when the papers die in the next five years. Hey Allan, how does the future look for big city small newspapers (such as in NYC-Queens Tribune, Bayside Times...etc...very local papers that divide big cities into neighborhoods)? Whats a good lateral movement for a print reporter? I have been thinking about the future of periodicals for a while, and believe that the future belongs to aggregations and recommendations. Self-publishing is a reality. Self-editing is a laugh. People have tools to delived tons of material, but don't possess the professional judgment to winnow it. My latest blog entry, "Of Editors and Advertisers", at rekording.blogspot.com elaborates on this theme.